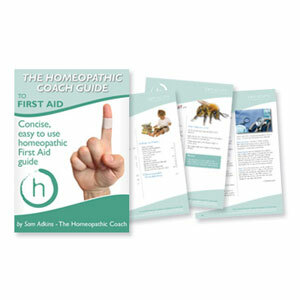 This e-Guide from the Homeopathic Coach will enable you to treat first aid situations from bumps and bruises, to shock and surgery with homeopathic medicines. Do you want to Use Homeopathy for First Aid? A concise, easy to use guide. 15-plus Different First Aid Situations Covered! This type of homeopathic prescribing is easy for someone totally new to Homeopathy and the guide suits both people who are just starting out as beginners, and those who have been using homeopathy a while and want some comprehensive information in a quick, handy reference format. Clear distinctions between homeopathic medicines so you can be sure to get the result that you need.